Wooden blinds are a wonderful design and practical addition to your interior. Wooden blinds, due to the natural appearance, incorporate into any interior, where it is necessary to evoke a luxurious and comfortable atmosphere with a hint of nature. Wooden blinds are tailor-made according to your specifications or professional measurement of our technicians. The price of wooden blinds depends on the dimensions (width, height) selected slats and the type of control (manual, motor). 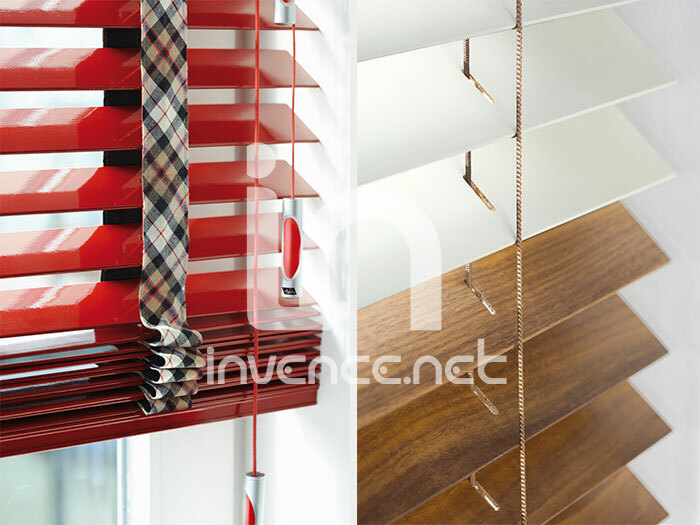 We offer a number of technical design, finishes, colors slats and guiding strips for wooden blinds. Indulge yourself with natural structure of conventional and exotic woods such as oak, beech, larch, pine, apple, linden, willow, chestnut, light or dark ash, red and sugar maple, American walnut, zebrawood, bamboo, tamarind, teak, rosewood and others, or you can be enchanted by the high-gloss of piano lacquer and perfection, or you can choose scrubbed, sanded and grooved surface. Check out our swatch of slats wooden blinds. A decorative 35 mm wide ribbon looks very modern and compared to the usual string ranking. We also offer special treatment of wooden slats, which allows the use of blinds in humid environments such as kitchens or bathrooms. To the luxury interiors we provide special slats covered with leather in several colors.